One Year of Unity | Barbara, Vegas, and Lonnie travel the USA for one year in a Unity RV. Barbara, Vegas, and Lonnie travel the USA for one year in a Unity RV. Florida was nice but Vegas did not get any beach time. So we went to Padre Island. We just got back from Tampa where we boon-docked for two nights at the Tampa RV show. This show is unbelievably large and a great place to boon-dock. We met up with six other LTV Unity Owners and had a blast boon-docking. The next night we boon docked at Bass Pro shops and had dinner at the restaurant. L’Auberge is great for boondocking! The dog park at Coushatta Casino Resort is one of Vegas’s favorite places. We have been grounded in Austin for the last few months. Doctors’ appointments and the passing of Barbara’s brother Rick have kept us close to home. Fortunately, we were able to make one short trip to Oklahoma for a rally of Texoma Travelers LTV RV’s (a travel club that we joined). The rally was at WinStar Casino just across the Red River from Texas. We like these rallies and are looking forward to the next one in Louisiana. Some people may call us crazy to go camping in 100 plus degree weather, but here at Emma Long Park we are camped at the water’s edge with large shade trees surrounding us. So, even though it is definitely hot the breeze off the lake and the shade of trees makes it most pleasurable for most of the day. Lonnie and Vegas have enjoyed tubing in the lake and we have all found this time most relaxing. The evenings are spent sitting lake side sipping on a refreshing gin and fresca watching the boats cruise by. Each morning we have taken Vegas to Turkey Creek for a 3 mile hike. The trails are located about one mile from the park. Turkey Creek is a dog friendly off-leash area which Vegas has thoroughly enjoyed running free and splashing in and out of the creek. Her enthusiastic joy is something to behold – one has to be a boxer owner to know what this looks like. Since it’s so hot we want to keep the outside cooking to minimum amount of time so I brought along my Sous Vide. Sous Vide is a cooking tool that heats water to a specified temperature then holds it at that temperature to cook food that is sealed in a food saver bag. The food will fully cook with little to no effort to the exact desired doneness. Once cooked then I quickly sear the meat, about one to two minutes per side and then dinner is done with the least amount of heat or mess. Great, you should try one. Dinner is ready, time to go. 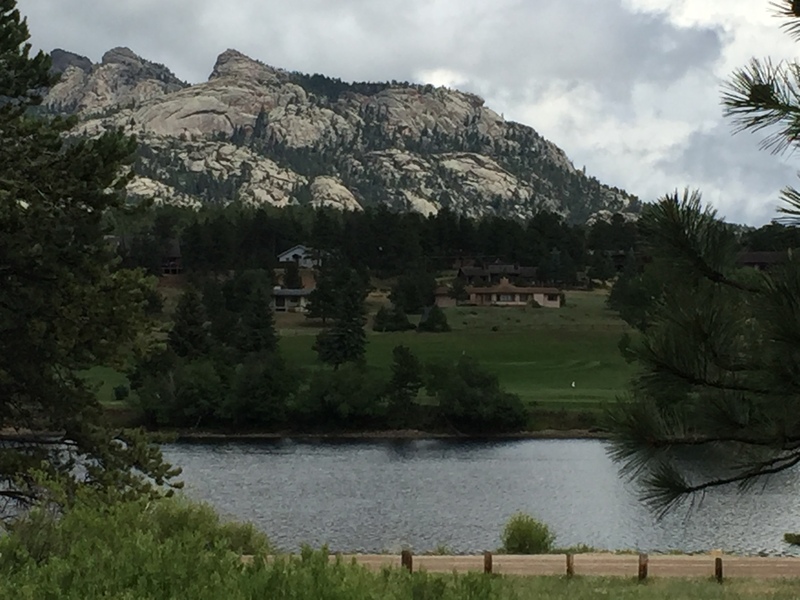 We left beautiful Estes Park hoping to spend a few nights back at Golden Gate Canyon State Park but unfortunately all the sites where booked. Well, it’s all part of the adventure, so we continued on to Cheyenne Mountain in Colorado Springs. We stayed there a couple of days and enjoyed hiking the Garden of the Gods and took a day trip to the Manitou Indian cliff dwellings. The afternoon temperatures were reaching a 100 degrees which is most unusual for this area. So we decided to go to Red River New Mexico where the temperatures are a high in the low 80’s. We checked the fire situation in New Mexico and all seemed fine for that area so we departed for our favorite campground along the Red River. When we pulled up at the campground the National Forest Service had just closed it for precautionary reasons. Evidently the day before a careless camper caused a forest fire in the Gila Forest and New Mexico was shutting down all the National campgrounds. Again, it’s all part of the adventure – onward to Albuquerque. There is a RV park we like their called Route 66, because it is located on the original famous Route 66 through New Mexico. Also, the RV park is located within a short walking distance to the Route 66 Casino. We are homebound as we have some obligations next week, but wishing we could turn around and head back to Colorado. Wow, what a fabulous little town. All the National and public campgrounds were packed so we stayed at Spruce Lake RV park. We were disappointed at first not staying in one of the campgrounds but this RV Park is nice and very convenient to everything. There are a several restaurants, a grocery store, and the free public shuttle all within a very short walking distance. If you are traveling in an RV you can find parking downtown at the visitor center and also at the Library. They do allow overnight camping but the parking spots are very limited. We enjoyed sightseeing and walking around this beautiful town. The Scandinavian Midsummer Festival was going on celebrating the summer solstice with music, dancing, Scandinavian culture education, food, and various vendors. We also rented a jeep from Backbone Adventures to drive the very rough off-road trails on the edge of the Roosevelt Forest. Lonnie very much enjoyed driving this challenging road. The jeep literally went over boulders, sideways along the road wash-out areas and straight up and straight down — very bumpy ride — yet worth the trip. The scenery was also divine. We have been enjoying the temperatures, highs in the 70’s and lows in the 50’s with very low humidity. This climate just makes one feel energized and want to spend as much time outside as possible. Considering our hometown, Austin, Texas temperatures in the 100’s. No wonder so many Texan’s travel to Colorado. The park is 12,000 acres of beauty with elevations ranging from 7,600 to 10,400 feet located northwest of the city of Golden. We hiked 4.0 mile trail to Panorama Point with very scenic views north towards Rocky Mountain National Park. 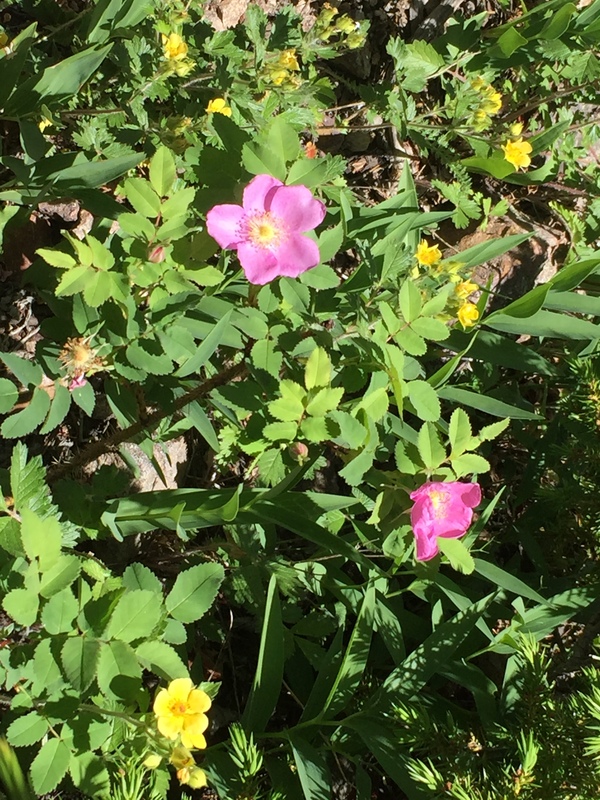 The trail is heavily wooded with Aspen, Lodge Pole and Ponderosa Pines with various colorful wild flowers along the path. The trail is considered moderate but there is an elevation gain of 1,043 feet – whew. I know what goes up must come down, I just don’t remember anything but climbing up, up and up some more. The hike was well worth the effort and we enjoyed it thoroughly. The campground has large sites, lots of trees for shade on a sunny afternoon and very quiet. We found it very relaxing listening to the rustling leaves of the Aspen trees; it almost sounded like the waves gently rolling onto a beach. So enjoyable to sit outside and just take in the scenery and the sounds. This is a wonderful State Park and I would recommend it to anyone traveling this way. There are several old mining towns within a very short driving distance to explore on short day trips from the State Park. The elevation is 6,288 feet and finally some nice cool weather. This park is fairly new as it opened in October 2006, it was formerly the JL Ranch and it is a 5 star park and deserves every star. They have over 23 miles of hiking trails but only a few short trails where dogs are allowed. The park does offer a stunning transition from the plains to its peaks. 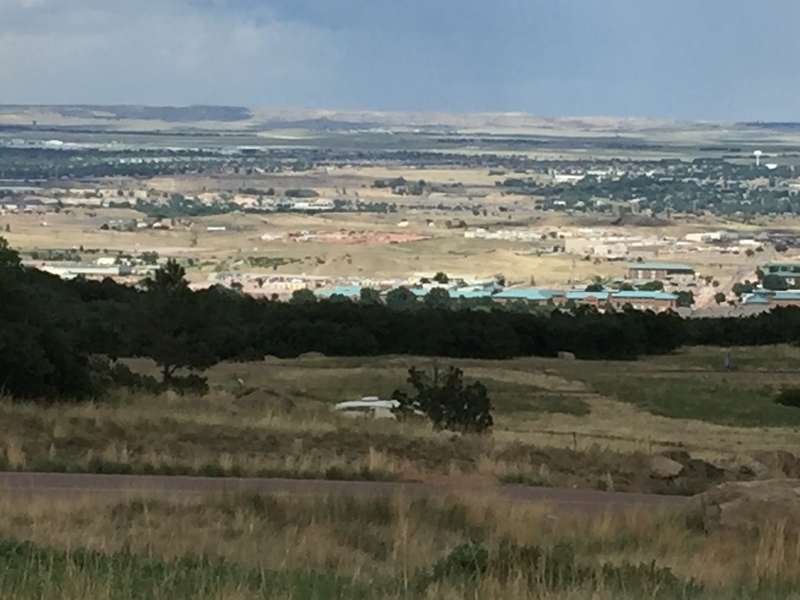 We have a fabulous view from our site to Colorado Springs below. Up the mountain from our site is NORAD (North American Aerospace Defense). We arrived late afternoon and the Lake Hasty RV sites where full but there was an available site at the Reservoir. It was a boondocking site but it had a beautiful view of the lake and large open area for Vegas to be able to run free. We enjoyed this stay very much. Drove to Guymon so Lonnie could revisit his parent’s hometown. We had planned to stay at the Drive-In RV Park but it was too early to stop for the day. We did check out the park and it was pretty nice and would be a good place to stay if in that area. Oh yeah, they show movies on the weekends. This park received its name from the numerous underground streams creating a “boiling” effect. The area surrounding the park is semi-arid climate and sparse vegetation so the park is often referred to as an oasis. It has a very pretty lake for boating and fishing, a swimming pool and many shaded RV sites. We were hiking on one of the trails and came across a fawn hidden under some brush, it was so precious, we stayed our distance so not to cause any harm. June 13, 2018 we began on journey toward Colorado. We made a brief stop in Fort Worth to take a tour of the U.S. Bureau of Engraving and Printing. Over half of the nation’s currency is produced at this facility. The tour was very interesting and there were billions of dollars being printed. To complete a note from start of the offset printing process (blank paper) to finished currency in the vault is approximately four weeks. Our drive continued to the WinStar RV Park next to the WinStar casino. We were interested in checking out this site as our TEXHOMA LTV club will be holding their rally there in October. It was nice and will probably be a good location for the rally. Again, another city rich in history beginning in 1733 when General James Oglethorpe landed there. He named the 13th and final American colony “Georgia” after England’s King George II. The city surrendered to Sherman during the civil war to save the city from being burned. The city is a 2 mile square butted against the sea with loads of restaurants and shops along every street. Charleston is a very pretty and historic city. It was first settled in 1670 and being a sea port became a focal point in the American Revolution confiscating tea in protest to the Tea Act. The southerners fired the first shots of the civil war against the Union at Ft. Sumter. We walked the promenade along the shore to the popular pineapple fountain where children were happily wading in the small pool surrounding the fountain. Vegas got an opportunity to run in the dog park but she couldn’t find a playmate, so we ventured on taking a walking tour of the city. We found Charleston very charming. St. John’s is the oldest church in Richmond and is the location where Patrick Henry gave his famous speech, “give me liberty or give me death”. We also drove down Broad Street straight through this historic town then to Monument Ave. passing grand old homes to statues of Jefferson Davis and Stonewall Jackson. A city rich in history of the revolutionary and civil wars. We toured Thomas Jefferson’s magnificent home outside Charlottesville. One item that was particularly interesting was his polygraph invention, a copying machine with two pens. When Jefferson wrote with one pen, the other made an exact copy. We learned he died at 82 leaving his family to pay his debt of $100,000.00. His family had to sell all his belongings and eventually the house to repay the large debt. So sad, luckily Uriah Levy and his nephew later purchased the house and worked to restore and preserve it until 1923 when the Foundation was formed to carry-on. Mid-April to the first of May a perfect time of year to visit Virginia as spring as sprung to its full glory. The bright colorful azaleas decorating everyone’s yards and the dogwood trees in full blossom along the highways, parks and yards – absolutely gorgeous. This is the first time I have seen a dogwood tree and I have fallen in love with them. Oh, and the tulips, everywhere with tall stems and bright colors decorating Williamsburg, Monticello and several other sites along the way. The drive has been very picturesque and most enjoyable. It has been a wonderful trip. I was so looking forward to driving along skyline and spending time in Shenandoah Park but unfortunately spring had not sprung in the mountains and the trees where still dormant. It was like driving through a forest of tall standing dead trees, it was very depressing and cold. The overlook views of the valley below where pretty and colorful but the drive and the camping not so much. We stayed one night on the mountain and drove to a nice state park, Morrow Mountain, in Albemarle, North Carolina. Our plans are to visit Myrtle Beach, South Carolina tomorrow. A few miles from Virginia Beach is Newport News where Charlie and Susan live. They use to live in Austin where Charlie had worked with Lonnie. They moved from Austin about 30 years so we were really looking forward to meeting up with them and getting reacquainted. We had a fantastic visit, they were excellent tour guides showing us around Newport News and Colonial Williamsburg. We had lunch at Kings Arms an 18th century tavern located in old town Williamsburg where the servers dress in costume. We had a good lunch served with a peach/orange ginger ale punch, which Lonnie really found memorable. Charlie and Susan were so gracious and opened their beautiful home located on the River to us. We thank both couples for welcoming us so warmly for a few days and showing us a very enjoyable visit. We had a wonderful visit with Peter and Mary Lee in Virginia Beach. Pete and Lonnie served in Viet Nam together 50 years ago. They were stationed on the USS Corpus Christi Bay repairing the avionics on damaged helicopters coming in from the battle field. They enjoyed catching up on each other’s life and it was nice for me to meet the guy Lonnie so often talked about from this time in his life. Pete and Mary Lee are a lovely couple, we thoroughly enjoyed our stay and we hope to meet up with them again in the future. The drive from Arkansas to Cherokee/North Carolina through the National Forest was absolutely beautiful. The forest was dense with the road weaving its way between a high cliff covered with ferns with occasional small waterfalls and Oconee River rapidly running on the other side. This area must be very popular in the summer as there were numerous white water rafting adventure businesses all along the way. We stopped over in Cherokee for a couple of days waiting out the rain to stop before we continued on to Virginia. We began this new adventure by meeting up with 36 other Leisure Travel Van (LTV) owners at DeGray Lake Resort State Park in Arkansas just outside of Hot Springs for a 3 day TEXOMA club rally of which we are a member. There were LTV’s of various models and years from mostly Texas and Oklahoma but a few came from Tennessee and one couple from Mississippi. We had a wonderful time meeting other LTV owners, seeing the new 2018 models, sharing travel adventures and learning about various modifications or enhancements one can make to their coach. The second night we all meet up for a large pot luck supper and fellowship. The third day we all drove into Hot Springs for a day of exploring the city. We walked the promenade along Bathhouse Row and strolled up and down Central Avenue. It was a lovely cool day perfect for sightseeing. We begin our travels to Virginia to visit with an army buddy of Lonnie’s from Viet Nam and visit with friends that one time lived in Austin. The rain started and has not stopped so far — we had planned to stop at an interesting state park in Tennessee on our way to North Carolina but in was raining so hard we decided to keep going as the park would be muddy. We stopped for the night in Murphy N.C. after a long days drive. We went to Louisiana to see Gabriel Iglesias. I love this guy. He is funny!!! There was wind warnings for north and central New Mexico yesterday and we were unfortunately right in the mist of it all. We drove mostly with a modest tail wind but as we near our campsite the wind significantly increased causing a warning message to come on the dash indicating a tire or tires were not getting sufficient traction – now that’s some cross wind. I am not sure exactly the speeds but the news had published sustained winds of 36 to 40 and gust 50 to 60. This horrific wind blew from 11am Sunday to sometime after 1am Monday morning. I found the shaking RV and the loud wind noise to be alarmingly unpleasant throughout the night. Thanks to be God we made it through with no damage to the RV or ourselves. We gratefully departed for Texas this morning. Tonight we are staying at Hord’s Creek Lake a U.S. Army Corps of Engineers campground at the Lakeside Park area. This is a beautiful park with a tranquil lake, large oak trees and extensive openness. We are enjoying the relaxing atmosphere and grilling a steak for dinner. We will be home tomorrow and this trip from Austin, Texas to Palm Springs, California and back has been very memorable. We have experienced majestic landscapes through New Mexico, Arizona and California and various temperatures from hot to frigid, we have rode horses, boated, rode the tram, hiked and have camped in the mountains to the valleys. We also had some other experiences as my car was stolen from the dealership where it was in for repairs. The dealership was most helpful in dealing with the police and keeping us informed of the on-going situation while we were traveling. Luckily the car was found with no damage and the person arrested. The dealership retrieved the car in our absence from the impound lot, detailed it and are storing it for me until our return. Also, on the way to Phoenix a truck through a rock, like a bullet it hit the driver’s side causing enough damage we will need to replace the windshield. Fortunately we have insurance to cover the windshield. Whew, a nice nights rest tonight in this lovely campsite, hopefully uneventful, and up early heading for Austin. We departed Mount San Jacinto early morning with light rain, spotting a beautiful rainbow on our way down the mountain toward Yuma, Arizona. Spent the night in Yuma where the wind was strong and dusty, creating a thin layer of dust throughout the RV. I wanted to drive through the Superstition Mountains of Arizona, outside of Phoenix, so off we went stopping at the Wild Horses Casino in Chandler to spend the night were we enjoyed an exceptional steak dinner at Shula’s steakhouse. The Apache Trail through the Superstition Mountains is 40 miles long beginning at Apache Junction and ending at Roosevelt Dam. The Apache Trail was a stagecoach trial and named after the Apache Indians who originally used this trail to move through the mountains. The road, no, the trail winds steeply through rugged desert mountains with two lakes, Canyon Lake and Apache Lake. The pavement ended after 18 miles leaving the rest of the trail mostly one lane dirt road, rough as an old wash board, and with hair pin turns. It took us 4 hours from start to finish. The scenery was remarkable but not sure it was worth the long and tedious drive. We found a lovely park about two hours away called Fool Hollow Lake Recreation Area near Show Low, AZ. The drive on HYW. 60 to reach the lake was even more scenic than the Apache Trail and it was paved, the highway passed through a beautiful mountain range with deep gorges. We spent a wonderful day at Fool Hollow, located in the mountains with tall pines, cool temperatures, fresh air and good hiking trails. 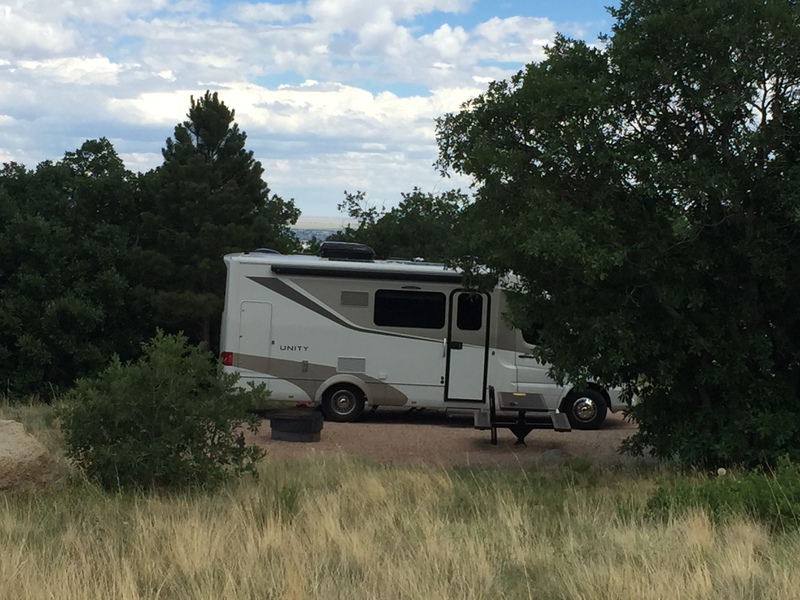 We are now beginning our return route homebound and took off for Albuquerque where we spent the night at the Route 66 Casino RV park, which was one of the nicest private RV parks we have stayed and would recommend it to anyone passing through this area. Today, New Mexico has issued high West winds alert, 25 to 35 winds with gust as high as 70 miles an hour. The drive west from Albuquerque heading to Texas has been windy and after about 250 miles we stopped at the Oasis State Park where the wind is alarmingly high. The RV is rocking, the wind whistling around the windows, the air vents rattling, with a dust storm blowing outside and is forecasted to last until around 1 am tomorrow morning. It should be an interesting night. We made it into Palm Springs late afternoon after a long drive through the Mojave Desert. Palm Springs is a pretty city with business and home entrances filled with an abundant display of colorful flowers. It seemed like there was a lush golf course every few blocks and streets are named after movie stars and presidents. Unfortunately there must be smog or some other air pollution because we both had sinus problems so bad that we were ready to depart after one day. Up to Mount San Jacinto State Park to experience the Palm Springs Aerial Tramway. The Tram departs about every 10 minutes up the mountain from zone 1 of 3,500 feet to zone 5 of 10,834 feet, straight up the mountain with absolutely gorgeous views. Once on top the mountain there are several trails to hike, we took the desert view trail. The temperature was cold enough for a coat but not too cold, the air was fresh with the scent of pine. Immediately we both felt better and our sinus problems were no longer. We enjoyed the mountain so much we decided to find someplace in the mountains to spend the next couple to days. Off we went to find one of the Mount San Jacinto State Parks that allowed RVs. The only ones we found were located on the other side of mountain from Palm Springs. We drove from Palm Springs up the steepest, narrowest mountain road toward Idyllwild I believe I have ever experienced and we have been on some thrilling mountain roads in Colorado, but this one beat them all in terms of scary – I was too scared to close my eyes and too scared to keep them open. We finally made it to Thousand Trails RV Park about 8,000 feet elevation. The park is very large with numerous trails, giant pines, the freshest air and perfectly cool temperatures. We hiked 5 miles today and feel pleasantly exhausted. It is so quiet here, only the whispering of the wind blowing through the trees and so scenic one cannot help but feel peacefully one with nature. Today we are staying at Pirates Cove, a peninsula right on the Colorado River’s edge in Lake Havasu, California. We rented a pontoon boat for the day and drove it to Topock gorge, anchored and had lunch. The gorge is beautifully surrounded by large rust colored mountains with crystal clear water. Our second day at Dead Horse we went for a ride on a couple of live horse through the 400 acre park. Bill, a 77 year old cowboy that has been riding horses most of his life was our trail guide. He worked the Dead Horse ranch in his younger days when it was privately owned. He was very entertaining sharing numerous stories of his years riding horses, driving wagons, ranching, and dealing with mules (he doesn’t much like mules). The trail ride was especially exciting when crossing the fast running creeks and for a moment I thought me and my horse were going to end up floating downstream, but we made it safely to the other side. Whew! We drove highway 40 West from Albuquerque, New Mexico to Sedona, Arizona stopping at the Petrified Forest National Park that is located just off HWY 40 about a 2 hours from Flagstaff, Arizona. We drove the 28 mile road that runs through the entire park. The main sights are the painted desert, the blue mesa, the jasper forest and the giant logs. The painted desert is characterized by colorful bands of sedimentary rock called the Chinle Formation. This formation was deposited between 227 and 205 million years ago by northwest flowing river system. The petrified wood are colorful specimens of massive tree trunks strewn across the landscape. The trees were knocked down by wind or water and carried downstream being buried by layers of sediment over 218 million years ago. The logs soaked up groundwater and silica from volcanic ash and over time crystallized into quartz. Truly breathtaking sights of beauty and wonder. named. When the owners gifted the land to the state for a park they requested the name remain — so there you have it — dead horse ranch state park. Yesterday we hiked in Sedona at Red Rock Crossing along a clear river gently flowing along the trial to view the impressive red Cathedral Rock. Temperatures in the low twenties made Albuquerque a very “cool” place to camp. The first stop on our new adventure was Lake Colorado City State Park which is located about 30 miles north of San Angelo, TX and serves as a peaceful resting stop after a long days drive. We basically had the park to ourselves with only a couple of other visitors. Our next stop over was Bottomless Lakes State Park in Roswell, New Mexico which is located half way between Lake Colorado City and Albuquerque. This state park consist of a chain of eight lakes that are actually sinkholes that range from 17 to 90 feet deep and are nestled along the red gypsum bluffs. The sun was hot and the water was cold making it the perfect place for Vegas to enjoy playing in the water and running around. Today we are in staying Albuquerque, New Mexico at the Sandia Resort and Casino in their RV lot. The winds yesterday were blowing at 60 miles an hour which made for windy drive. Today the winds have calmed and we hope to be able to go up on the TRAM to the top of the mountain and have lunch. The windshield of the Tiny House found a rock outside of Baton Rouge and needed to be repaired. Fortunately, we found a great shop off Interstate 12 and they had us back on the road in fifteen minutes. Topsail is one of the best state parks in the country! Three miles of pristine beaches and enough hiking trails to keep you busy for weeks. The only negative of this park is that dogs are prohibited on the beach. Vegas really did not like the no dog rule but she found some other beaches that welcomed her. We are on our way to Florida and for the last two days we have been in Bay Saint Louis, Mississippi. Last night it got down to 27 and I had to winterize the tiny house. The sun is out this morning and we are heading for Orange Beach Alabama. Ah to be warm again. We just got back from three days in Louisiana and some wonderful meals. Vegas especially enjoyed this trip because the Coushatta Casino has a dog park. We needed a nature fix so we loaded up the tiny house and headed to Lost Maples, located along the Sabinal river west of San Antonio, Texas. This area is known for its big tooth maple trees. It offers several miles of rugged hiking trails through a quiet area of sheltered canyons, speculator views and scenic woodlands. as National Wildlife Refuge. Aransas hosts the largest flock of wintering whooping cranes in North America with over 250 birds. By mid-April they depart for a hazardous journey of 2,500 miles to nesting grounds at Wood Buffalo National Park, Canada. Even with 250 birds in the area one is still lucky to see cranes feeding in the marshy salt flats in the refuge, and we were indeed fortunate. We took off on the Heron Flats trail and spotted a pair feeding. Whooping cranes being 60 inches tall and with white feathers were easy to spot against the green/brown marshes. The birds were elegant and gorgeous, a thrilling experience. Luckily Lonnie had his camera because I forgot mine and when I walked back (a very short distance) to get my camera the birds had flown away by the time I returned. And added plus on the walk down the trail we spotted a few alligators sunning themselves on the shore line. The park rangers told us to keep Vegas on a short leash because the alligators like puppy dogs for snacks. So glad the gators kept their distance. Lonnie’s brother and sister-in-law (Dan and Barbara) who live in Arkansas would be visiting their son and daughter-in-law (Greg and Cathy) in Corpus. Great reason for a road trip, so off we went. We had dinner at Snoopy’s, a popular restaurant on intercostal canal, luckily they had a large roaring fire pit inside to warm everyone from the misty cold weather outside. The next day we were able to visit with Greg and Cathy whom we haven’t seen a several years and it was wonderful to spend time with family. After the family visits we took off to Padre Island National Seashore, Malaquite beach. We were very fortunate to find a great camp site with an ocean view and a very short walk to the beach. Vegas truly enjoyed running in the sand and chasing the birds. We stayed at a number of lovely parks along the way home; three that stand out the most were Hartwell State Park, South Carolina, Tannehill Ironworks Historical State Park in Birmingham, Alabama and Tyler State Park in Texas. Hartwell State Park is a sleepy little park right off the highway 85 on our route to Alabama. The RV sites are on a peninsula of a large water reservoir so that each site has a water view. It was a convenient respite from a long day of traveling. In the early morning there was a fog or as I like to call it, smoke on the water that gave the area a wonderful mystical feeling about it. At one end of the park was a very nice open area for Vegas to have a little off leash time to expel some energy. She was running around at full speed until she came to an abrupt stop just short of going over a 20-foot drop off the cliff into the lake below. I think we both almost had a heart attack, I know I am still traumatized by the event. Needless to say, she was quickly put back on her leash and we headed back to the RV to get ready to depart for the days travel. Tannehill is the site of an ironworks facility that produced the major supply of pig iron to the confederate army during the civil war. Portions of the original ironworks structure still stands. There were several large log cabins and a pretty little stream running through the park. The Park also holds a Halloween Festival each year and campers had already claimed there spots and put up elaborate decoration displays. It was like walking through a trail of lights Christmas display except it was all Halloween themed, orange twinkle lights, laser lights, blow up spooky creatures and graveyards. It was quite something. In fact, we stayed at several parks in Kentucky and Tennessee that also had a Halloween theme going on with most having trick or treat Saturday nights. We did not experience this in the Texas parks. Tyler State Park is a large park north of Tyler with a 64-acre spring-fed lake and 100 foot tall pine trees. We were looking forward to renting a boat the morning before we left but a cold front moved in with rain. We were disappointed but really enjoyed the evening before looking out over the lake and the tranquility of the park. We definitely want to return to Tyler State Park in the future. This marked the end of our October 2017 travels as we arrived home to Austin the next day. We had a fabulous trip and are already looking forward to planning another adventure. Our time in Kentucky has come to an end and we are beginning our return home. We decided a route through Tennessee, Carolinas, Alabama, Mississippi, and Louisiana to Texas. First, stop to the beautiful Great Smoky Mountains. Upon arriving, we were totally overwhelmed with the number of people who had the exact same idea as us. It was a beehive of activity with people swarming everywhere. It was so crowded we decided to just drive through the park to enjoy the scenery then keep going to a more tranquil environment. The Smokies had the best change of season colors we had seen on the trip as Kentucky who normally would have been at peak season by this time was experiencing a warmer fall than usual. The Kentucky Horse Farm is located in Lexington, Kentucky and was open to the public in 1978. This farm is dedicated to the history of the horse and man’s relationship with the horse through out the ages. They have two museums; my favorite was the International Museum of the Horse. The farm houses up to 2,000 horses at times of special events and they offer various attractions through out the year. The day we were there, we saw three attractions, the Hall of Champions, The Parade of Breeds, and the Draft Horses. The Hall of Champions provides stalls and care for retired champion thoroughbreds. A couple of the horses brought out for viewing were Da Hoss, the pretty chestnut horse (harness racer) and Funny Cide (Kentucky Derby winner), the one with his tongue hanging out. The Parade of Breeds showcased various breeds of horses from around the world and explained the history and purpose of each particular horse, all gorgeous. The Draft Horse exhibition displays the largest and strongest of the horses. The size of these animals is beyond belief, true giants. The largest one was over 2,000 pounds and 18 ½ hands high. The Kentucky Horse Farm has a convenient and very nice RV park adjacent to the farm, so we stayed there for a couple of nights. After so many years of watching the Kentucky derby on TV we were excited to visit this beautiful historic site. The walking tour of the race track and grounds was very impressive. They said 165,000 people come on Derby day with the general admission open gallery area costing $80 per person. We of course had to have the official drink of Churchill Downs, a Mint Julep. It was very, very tasty. They told me it was made with Old Forester bourbon infused with mint, it is the Old Forester Mint Julep label. It has made me wanting another one. Jim Beam is located south of Louisville on 25 acres and is very picturesque and well organized for people to tour the facilities. The Bourbon Chase, a 2 day 200 mile relay race along the bourbon trail started from Jim Beam’s this day, making our visit very festive with loads of people and music. We took a great tour/tasting, had a BBQ sandwich for lunch and a delicious bourbon ice cream sundae for dessert. A very enjoyable day. Well worth the visit. Wild Turkey is located in Lawrenceburg about 20 minutes west of Lexington. We had a great tour of the distillery, barrel aging facilities and tasting. My favorite was the American Honey Sting a liquor with honey and an infusion of pepper – that’s the sting – very tasty. The Land Between the Lakes National Recreational Area (LBL) spans both Tennessee and Kentucky. The first night we stayed at Paris Landing on the Tennessee south end of LBL. There was an identical Leisure Travel Van Unity just like ours park in a couple of sites over. We do not often see LTV’s so we where excited to meet the owners. We had a very nice visit with Alan and Dee that evening trading LTV travel stories. The next day we drove the 40 miles through the Land Between the Lakes, stopping at the Homeplace a 1850s Farm. We were excited they allowed dogs on the farm, so we enjoyed walking Vegas around seeing all the farm animals. The black ducks were very attracted to Vegas following after her. The farm had original and replica homes and barns as well as woodshop and tobacco barn that would have been on a working farm in 1850s. It was a very tranquil and educational visit. That evening we stay Canal Campground, the northend which is in Kentucky. We were very fortunate to get one of the last campsites and it had a very nice view of Kentucky Lake. This week was winter break for the Kentucky school system which meant all the parks were very crowded and sites hard to come by. The next day we drove to Hodgenville, Kentucky to visit Abraham Lincoln National Park and see the Lincoln Memorial and his birth cabin. Barb has been under the weather for the last few days but today she seems to be better and we will probably start our Kentucky trip some time tomorrow. Looking forward to tasting some bourbon and seeing some fall color. Last night we stopped south of Little Rock at Willow Beach COE. Willow Beach was a true delight, one of the best campgrounds we have stayed on any of our trips. The park is located on the banks of the Arkansas River with large oaks providing plenty of shade and wide spaced RV sites. It was also one of Vegas’ favorite sites as there was a large open space for her to run, run and run so more. Today we arrived in Memphis, Tennessee to tour Elvis Presley’s home, Graceland. We are staying the night at the Graceland RV Park located on Elvis Presley, Blvd., within a short walking distance to the Graceland Mansion. I never knew how Graceland received that name, but the mystery has been revealed to me today. The land was inherited by Mrs. Ruth Moore from her aunt Grace and the Moore’s built the large home on 13 acres and named the residence in memory of Grace – i.e. Graceland. Elvis purchased the home in 1957 with a purchase price of $100,000 at the age of 22. The mansion is extravagantly decorated in what was the most popular 1970’s décor. Very interesting tour. Off on the road again, we are heading to Kentucky. The first night we stopped northeast of Dallas at a US Army Corps of Engineers (COE) Lavonia Park located on the beautiful Lake Lavon. We enjoyed gazing at the lake from under the large shade tree on our camp site. The next day we continued north and stopped south of Texarkana at another COE, Malden Lake Park. Malden is a campground near Maud, TX on the Wright Patman Lake. We were interested in exploring this park because we enjoyed our stay on the other side of the lake at Rock point on our last travels. This must be a fisherman’s paradise because just about everyone here has a fishing boat and each campsite has a fish cleaning area. It is truly a beautiful park with tall pines and large oak trees, it looks kind of mystical when the light filters through the trees. So relaxing – especially a little nap in the hammocks. Off today toward Tennessee…. We finally got back to Austin but after a few days at home we needed to go camping. So off to Lake Travis where we found a wonderful campsite thirty minutes from our house. Crazy Horse Memorial when completed will be 563 feet high and 641 long. It was started decades ago by Korczak Ziolkowski and his children are working on the sculpture today. The face was completed in 1998. The purpose is to provide a memorial to not only the great leader of the Lakota tribe but also to be a remembrance of Native American History in the Black Hills that are dear to the Lakota. Next it was onto Mount Rushmore which was just a few miles down the highway. Impressive, spectacular, and amazing does not begin to describe the feelings we had gazing upon that mount. The wonderment of how they were able to carve such a massive sculpture with such fine detail visible from such a far distance is mind boggling. The gallery describing how this endeavor was accomplished was just as impressive as viewing the 4 presidents. A true wonder and well worth the time and distance to get here. A valued testament and tribute to our great leaders. We got an early start this morning to go to Bear Country, a drive through wild life park that is located 8 miles south of Rapid City, South Dakota. There is a collection of all the local species and they are kept in large open space where they can roam yet strategically separated so they do not prey on each other. They had elk, various species of deer, wolves, mountain goats, big horn sheep, mountain lions, and lots and lots of bears. The bears where roaming on the road and around the cars seemingly undisturbed. It was awesome to see so many bears especially in the safety of our car. Off to Sturgis to see the town where the largest motorbike rally is held every August, but first a stop in Wall. Wall is a very small town off Hwy 90 that has a nationally famous drugstore/café/gift shop that is a city block long and offers 5 cent coffee and fresh homemade donuts. We saw advertisements for it as far back as 200 miles. We just had to stop for coffee and donuts which were actually excellent. Onward to Sturgis for lunch at one of the biker restaurants. We ate at Knuckles which was the number one on TripAdvisor and were not disappointed. Now we can say we have been there. After lunch we proceeded to Deadwood with hopes of stopping for a walk around town but there was a classic car show going on with roads blocked off and no place for us to park. Oh well, we were growing tired and needed to stop for the night. We found a nice little park near a creek called Fish N Fry where you can catch your own fish and they fry it for you. We didn’t fish but decided on a salad after all that eating earlier. Tired and ready for bed. Minute Man Missile National Historic Site, Sturgis, and Deadwood S.D. The Minute Man Missile site is located about 5 miles outside the Badlands National Park on Hwy. 90. The nuclear site was disabled by Bill Clinton’s administration in an agreement with the Russians to decrease nuclear armament. It turned out the missile silo was located about 15 miles up Hwy 90 literately less than a mile from the highway. Amazing that so many people for so many year drove right pass this site never knowing it was there. In the agreement signed the U.S. was allowed to keep a couple of sites intact without the warheads obviously for historic and educational purposes. The Badlands is 244,000 acres with the most fascinating formations we have ever seen. There is a quote from Frederick Remington, an American Landscape Painter and Explorer and he said, “No words of mine can describe these Bad Lands. One set of buttes, with cones and minarets, gives place in the next mile to natural freaks of different variety never dreamed of by mortal man…” This says it all. We took the 27 mile scenic loop road through the park to view all the formations and we even saw some big horn sheep. Very inspiring and totally worth the visit. St. Joseph, Missouri was all a buzz about the eclipse. Our campground was packed with people from all over the country, lots of people wearing eclipse tee shirts and the local news was giving continuous coverage. The weather was cloudy and rainy but that did not dampen anyone’s enthusiasm for the event. The clouds obstructed the viewing but experiencing day turning into night was an awesome experience. The clouds cleared just long enough for us to wear those special glasses to see the diamond ring effect. Very memorable and looking forward to the next one that will be on April 8, 2024 passing over Texas. The next eclipse will require less distance but this journey has been so much fun. Before leaving St. Joseph we stocked up on supplies and headed to Omaha, Nebraska continuing our journey to South Dakota. There is a beautiful expansion pedestrian bridge that crosses over the Missouri river. Half way across the bridge you will have one leg in Nebraska and the other in Iowa. When we returned to our coach after our walk there was a gray Unity coach parked right next to us. They also had been in St. Joseph’s for the eclipse. We spent the night in Council Bluffs, Iowa (just across the river from Omaha) then headed the next morning to Sioux Falls, South Dakota to the falls at Falls Park. The falls come from the Big Sioux river as it cascades down to join the Missouri river. We took in the sights and enjoyed walking around the park but it had been a long day so we camped in Big Sioux State Park just 18 minutes from the falls. Today we are off to the Badlands National Park and hopefully will be able to find place to camp for the night there. It will be a long drive today. We traveled for a week to see this and Vegas is ready! This may not be the most elegant RV park we have stayed at but it is certainly the most crowded. We are starting to get excited as the eclipse gets closer. We spent a day and a half with Dan and Barbara (Lon’s brother and sister in-law) in Arkansas where we had a wonderful visit. Thank you both for the gracious hospitality. As we were preparing to depart Vegas freaked out and started running full speed ahead toward us but she was tied to a heavy metal chair that bounced behind her until they both slammed into the RV. Fortunately the only damage was a venting grate that can be easily replaced. Eventually everyone calmed down and we were off toward Kansas City. We could see a storm coming so turned off the highway to the nearest state park, Horseshoe Bend, was just a few miles away and luckily out of the path of the hail and strong winds. The park was exceptional. So blessed to have found beautiful shelter from the storm. Today we drove just a few miles south of Kansas City and are about an hour and half from St. Joseph, Mo. our destination for a full viewing of the eclipse. Our plans are to arrive there tomorrow, Monday the 20th to become acquainted with area to ensure the best viewing spot. And yes, we have reserved a place to stay, now we are praying for clear weather. Today we drove toward Little Rock, Arkansas to visit Pinnacle Mountain State Park in the foothills of the Ouachita Mountains, unfortunately it was too hot and humid to take advantage of the hiking trails. We are staying 2 miles from Pinnacle Mountain at the Maumella Campground which sits along the beautiful Arkansas River. The Arkansas River is one of the Mississippi’s largest tributaries. We are waiting for dusk hoping for it to cool down enough to go for a long hike. Tomorrow we are heading to Lonnie’s brother and sister-in-law’s for a visit then on to St. Joseph’s to view the eclipse. Six days into our trip and the weather has been clear, hot and steamy for the last few days. Yesterday we drove to Wright Patman Lake southeast of Texarkana and spent the afternoon and night at Rock Point Campground. The RV sites are at water’s edge and we enjoyed a beautiful sunset over the lake. We grilled a delicious steak with a bake potato for dinner, relaxed and took an evening walk. This morning we departed for Lake Ouachita, (Wash’itaw), Arkansas. This is one of the largest lakes I have seen with 975 miles of shoreline and 40,000 acres of water. This lake is known for fishing as it has been stocked with bass, walleye and stripe. The lake also offers wide open waters for boaters and skiers. Fortunately a beautiful campsite overlooking the lake with tall shady pine trees was available. Behind our site is a trail leading to a small beach which Vegas thoroughly enjoyed romping in the water. Not sure about tomorrows plans but we will be thinking about it this evening. I write this as I sit at our shady picnic table with a cool gentle breeze blowing off the water, ah life is good. We are into day 4 of our travels. The rain has altered our original itinerary making state parks to muddy. The first day instead of stopping at Brazos Bend State Park outside of Houston we drove through to Kinder, Louisiana to the Coushatta casino as they have a very nice RV and dog park. There was a free shuttle to the casino so Lonnie had fun playing craps and I enjoyed the buffets (no cooking required). Our next stop was to see my brother John and his daughter Leslie in Baton Rouge, LA. One year ago there was a massive flood in Baton Rouge and his home had received six feet of water and had to be totally gutted and redone. His home has been beautifully restored thanks to the tireless effort of Leslie. John is grateful that from tragedy has come good. We had a wonderful visit and delicious fresh seafood dinners that can only be found in Louisiana. Thanks for the hospitality John and Leslie. Off towards Arkansas but first a stop in Marksville to check out the Paragon Casino and RV park — still raining – we had planned to go on to Piney point near Texarkana but heavy rain is forecast over a wide area between here and there so we will stay here today with hopes the weather clears and we can resume on travels. Good news is we have some winnings in our pockets, good restaurants, something to do while it is raining and no muddy campsite. So all is good. We have been grounded at home for a couple weeks but on Monday, we go and get the Tiny House and start getting ready for a five-week trip to the Dakotas. The highlights of the trip include visiting with family along the way, the Eclipse, and Mount Rushmore. I just downloaded Willie Nelson (On the Road again) and made it our official theme song. I have feeling that we will be listening to that song many times over the next year. Emma Long Metropolitan Park is a large municipal park in northwest Austin, Texas. The park is on the shores of Lake Austin and was originally called City Park. The RV sites are excellent, several are waterfront. getter relaxing in her tube enjoying the sights, sounds and people. Garner was packed with large groups of families many with signs indicating their name and how many years they had been coming to Garner. The family next to us had been coming for 25 years. Everyone was extremely friendly and children of all ages were enjoying all aspects of the park. Biking, hiking, tubing, paddle boating, swimming, playing volleyball or just sitting enjoying the scenery. Each night a jukebox dance is held at the pavilion and there is obviously a dress code for teenage girls as they were all wearing blue jean cut off short shorts and cowboy boots. There are people of all ages enjoying the music, dancing or just watching. Vegas was especially popular at the dance, every young girl wanted to pet her, in fact everywhere we went the girls would approach asking, “can I pet your puppy, you’re so cute” I nick named her the chick magnet. Too bad Lonnie isn’t younger and single…. We had a great time but took off to explore what other parks were between Concan and Austin. We visited Blanco State Park which looked great. The Blanco River flows through the park and it has large shady RV camp sites, unfortunately there was no availability for the night so off we went to check out Guadalupe River State Park, near San Antonio. The picturesque Guadalupe River runs through the park with very nice picnic sites. The RV camping sites are a bit of a walk to the river but still a most enjoyable location. Fortunately they had a site available for the night and we camped there and enjoyed our stay. We made it back to Austin and found 100 degree temperatures and no air conditioning in our home. Once again we are so thankful for our Unity, we just spent the night parked in our driveway with the Unity’s air conditioning blowing cold air. We got the air conditioner fixed the next day and are now ready to celebrate the 4th of July. 135 bullet holes. Touring this memorial was both emotional and educational for me. One of the exhibits was scuba equipment which brought back many memories of my time diving in the Mekong Delta. We have settled in for the night at Columbine Campground in the Carson National Forest right outside Red River city limits. We were fortunate enough to get the last campsite and what a beauty, right on the flowing red river, lots of shade trees and cool temperatures, it was around 77 when we arrived and should be about 49 tonight. This is actually the coolest temperatures of our trip as Colorado was experiencing a heat wave. Looking forward to a good night sleep as we are tuckered out for our days journey. Today we left the Sky Ute Casino Resort (an excellent RV campground) and after two hours of driving we were dead tired. Fortunately we found a Family Dollar store and stopped in their parking lot for a nap. After 45 minutes we were on the road again, wide awake and glad we are traveling in our Unity.